Seven stripes light blue-green-dark blue-green-dark blue-green-dark blue with the town seal(?) on the center depicting a headland with a lighthouse and prominent sunrise scene. The town name and date of incorporation are placed on the lowest dark blue stripe. 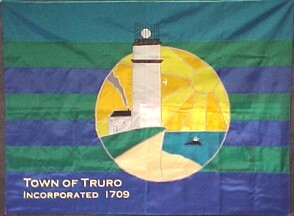 From www.truromass.org/stuac/ the flag was designed by a Truro Central School third grade student, and now hangs in the Massachusetts State House.